The recently launched Frunch concept at Rainforest Lounge, Gulf Suites Hotel in Amwaj, is one that is not to be missed. Frunch – ‘Fun-Filled Friday Brunch’ – is a food fest that ticks all the boxes with Bahrain's experienced foodies. 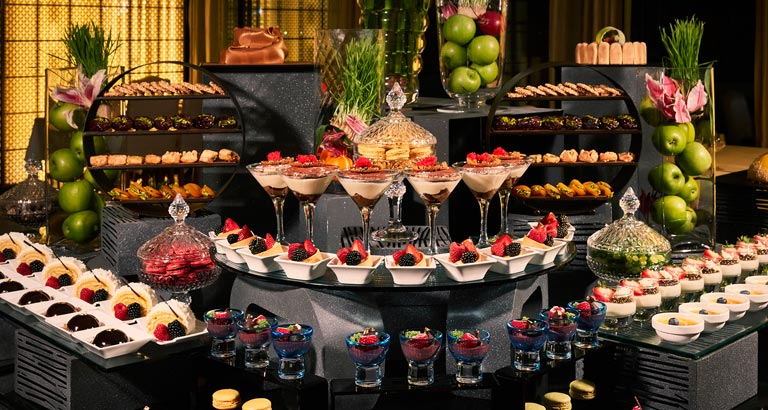 Several exciting cuisines across an international buffet, including fresh seafood, roasted meats and colourful salads, as well as live cooking stations, are part of the offering. It’s very possible to miss a whole section at this lavish culinary spread, so make sure you take your time to explore all your options before you take your pick. You can choose your preferred catch at the fresh seafood display, and the chef at the live cooking station will recommend a sauce and cooking style to create a dish just as you like it, with vegetables of your choice. While the seafood cooks to perfection, you can take a look at the extensive salad selection, featuring deli meats, fresh breads and an impressive display of shellfish. All ingredients are noticeably fresh, with no scrimping on quality. Plenty of succulent, roasted meats, with traditional sauces, await to please your palatte. The abundant, eclectic spread is amongst the largest on the island, and the kitchen does a great job in indulging guests by keeping the fare fresh and tasty. There’s a wide array of beverages on offer, along with live entertainment, a resident DJ and comfortable seating sections. Opting for the beverage package gives you an even wider choice and the best value for your money. Rainforest Lounge’s Frunch costs BD15, inclusive of soft beverages, or BD21 for the all-you-can-drink package. Kids below 12 years of age are charged BD9 and those below six years dine for free. Special discounted prices are available for groups and advanced reservations. Call 33 180-001 or 33 159-437.